In Islamic thought, the ideas and themes relating to the “end of the world” fall under the doctrine of qiyāmah (“rising”, “resurrection”). The Qur’an contains hundreds of references to qiyāmah under various names including: the Day of Resurrection, 2:85; the Day of Mutual Disillusion, 64:9; the Day of Mutual Calling, 40:32; the Day of Decision, 37:21; the Day they are raised up, 7:14; the Day of Judgement, 1:4; the Day of Gathering together, 50:44; the Day they come forth [from the tombs], 70:43; the Day of Imminence, 40:18; the Day when the Hour comes, 30:12; the Day of Reckoning, 14:41. For the people of the exoteric (ahl al-ẓāhir), qiyāmah is when physical world comes to an end and all things return to God for the final judgment. They expect qiyāmah to be preceded by a series of natural disasters and physical events including earthquakes, disasters, wars, the opening of the heavens, and other such things. In the esoteric perspective, qiyāmah is not a physical event, but rather, it is a spiritual or soul-related event which has effects and manifestations in the physical world. This is because qiyāmah is related to creation (khalq). Imām Sulṭān Muḥammad Shāh explains that “the creation according to Islam is not a unique act in a given time, but a perpetual and constant event” (Memoirs of the Aga Khan). Similarly, qiyāmah is an event that occurs in every moment and instant – although it is hidden and not perceived by most people. Just as time is continuous, it can be felt, measured and aggregated in certain intervals – seconds, minutes, hours, days, years, decades, etc, in the same way, the qiyāmah which is ever-occuring can be experienced in intervals. When a being fulfills and actualizes the limit (ḥadd) of its own existence, this is the “metamorphosis of being which esoteric parlance designates as qiyāmah, resurrection.” (Henry Corbin, Temple and Contemplation). Thus, qiyāmah is a direct culmination and the recompense (i.e. reward, punishment) of the previous actions and events in the life of a particular being. All human beings undergo qiyāmah as they ascend from one level of consciousness to the next – such as the progression through the mineral, vegetable, animal, and rational souls in earthly life. Thus, we can speak of involuntary qiyāmah – when the human soul experiences the death of the physical body and is resurrected in the astral or imaginal body. There is also the voluntary qiyāmah – when the human soul undergoes the final death and attains union with God – such as the spiriual mi‘rāj of the Prophet Muḥammad. A collective qiyāmah is something experienced by a group of human beings – such as a community, a nation, a civilization, or even humanity as a whole. According to the esoteric meaning (ta’wīl) of this verse, the six days in which God creates the heavens and the earth are six historical cycles of prophecy and religion. The “world” created in during these six cycles is the “World of Faith” (‘ālam al-dīn). When the Sixth Prophetic Cycle comes to an end, the Seventh Cycle begins. The Seventh Cycle, in the Qur’anic verse above, is referred to as the establishment of the Throne. This Seventh Cycle is the Cycle of the Great Qiyāmah. This is because a cycle of prophecy consists of the dominance of the religious Law (sharī‘ah) in which spiritual truths (ḥaqā’iq) are concealed in symbols and only available to the initiates. The Cycle of Qiyāmah is when the spiritual truths are unveiled to the public. The meaning of qiyāmah is literally “rising” and the meaning of the word “apocalypse” is “revelation”. Therefore, the qiyāmah or apocalypse is not the end of the physical world, but rather, the revelation, rising or unveiling of spiritual truths to humanity. A visual depiction of the Seven Prophetic Cycles of Adam, Noah, Abraham, Moses, Jesus, Muhammad, and the Qa’im. Each Cycle spans approximately 1,000 years. Indeed, the very purpose of the previous Prophets, Messengers and Imāms and their missions was to prepare the way for the arrival of the Qā’im and the Cycle of Qiyāmah. The function of the Qā’im is to be the “lord of reckoning” instead of a “lord of sharī‘ah” like the Messengers of God before him. Many religions have described the coming of the Qā’im under different terms and symbols such as the Messiah, the Kalki Avatara, Matreyah, the Mahdi, and others. According to the Ismā‘īlī gnosis, the Qā’im is not some random person who appears out of nowhere, but he comes from the lineage of the Imāms from the progeny of the Prophet Muḥammad and Imām ‘Alī ibn Abi Ṭālib. In the Holy Qur’ān, all the various names of qiyāmah such as the “Hour”, the “Last Day”, etc. are references and allusions to the holy personality of the Qā’im. The Prophet Muḥammad once said: “I and the Hour were sent like these two forefingers.” That is to say, Muḥammad is the final Prophet to appear before the coming of the Qā’im. The Prophet’s analogy of himself and “the Hour” as “two forefingers” means that they are both similar in the sense of being divinely-inspired human beings. In Ismā‘īlī gnosis, the Qā’im al-Qiyāmah is the most eminent human being in the entire Cosmos. His soul encompasses and integrates the virtues of all the Prophets, Imāms, sages, saints, and luminaries who preceded him. In this sense, Henry Corbin refers to the Qā’im as the “Perfect Child” because he is the most perfect soul to be created by the Universal Soul and it is through him that Universal Soul actualizes its own perfection. “It is said, for example, that the Qā’im, the aim and goal of all the hudūd, the degrees or “horizons”, is the Grand Cycle of which the Imāms are the periods or partial cycles, just as each Imām is himself a cycle in relation to his ḥudūd. … It is also said that the Qā’im is the “coalescence” (majma), the corpus mysticum of all the ḥudūd; each of the Imāms has his own corpus mysticum, his Temple of Light, and all are gathered together and integrated in the Sublime Temple of the Resurrector. Over one thousand years ago, several Ismā‘īlī pīrs, hujjats, dā‘īs, and philosophers offered prophecies, descriptions, and explanations of the how the Great Qiyāmah would occur and what its signs and effects would be. It must be remembered that since Qiyāmah is a spiritual event, then all the verses and descriptions of it in the Qur’ān and other scriptures must be understood symbolically using the technique of ta’wīl (esoteric interpretation). And how can We convey to you what is the Night of Power? Peace it is, until the rising of the Dawn. The beginning of the Cycle of Qiyāmah is the appearance of the Night of Power (laylat al-qadr). Exoterically and historically, the Night of Power was one of the last odd nights of the Month of Ramaḍān. But esoterically in light of the qiyāmah, the Night of Power, refers to an august personality in the World of Faith who begins the Cycle of Qiyāmah. All Nātiqs were accompanied by their Asās – the first Imām of the new Cycle who served as the Ḥujjat (proof) and Bāb (gate) of the Nāṭiq – like Imām ‘Ali was for the Prophet Muḥammad, or Imām Shith (Seth) was for Prophet Adam. Similarly, each Imām has a son who serves as his Ḥujjat/Bāb and later succeeds him – like Imām Ja‘far al-Ṣādiq was for Imām Muḥammad al-Bāqir. On the same lines, the Qā’im al-Qiyāmah is also accompanied by his own Ḥujjat or Bāb – except that whereas the Ḥujjat/Bāb/Asās of every Nāṭiq or Imām came after him, the Ḥujjat or Bāb of the Qā’im comes before him. That is to say, the Qā’im’s own father or the preceding Imām (instead of his son or the succeeding Imām) will serve as his Ḥujjat or Bāb. The Qā’im, in the symbolic language of the Qur’ān, is called the “Last Day” (yawm al-ākhirah) or the Seventh Day (in the Bible). And therefore, the “Last Day” is preceded by the greatest of all nights – in the language of the Qur’ān, this is called the Night of Power (laylat al-qadr). According to the science of ta’wīl, the Night of Power stands for the great Imām who functions as the Ḥujjat or Bāb of the Qā’im and the entirety of Sūrat al-Qadr is a metaphor for the exalted personality of this Imām. The meaning of al-Qadr is the Qā’im of the Progeny of Muḥammad (qā’im-i āl-i Muḥammad) and the meaning of Laylat al-Qadr is the Ḥujjat or Bāb of the Qā’im. The Qur’ān explicitly states: “We revealed him in the Night of Power”, i.e. “We revealed the Qā’im in the personality of his Ḥujjat.” This means that the Qā’im will carry out his mission, reveal his knowledge and display his glory in the physical world through the person of his Ḥujjat. The Cycle of Qiyāmah is thus inaugurated in by not one, but two figures – the Ḥujjat of the Qā’im and the Qā’im al-Qiyāmah. This idea of two messianic figures is also paralleled in the Abrahamic traditions. The Sunni and Twelver Shī‘ī Muslims await the second coming of the Prophet Jesus and the Mahdī of the progeny of Prophet Muḥammad. The Jews await Messiah and the second coming of the Prophet Elijah – who functions as the “interpreter” of the Messiah. These are all symbolic designations for the manifestation of the Ḥujjat of the Qā’im and the Qā’im al-Qiyāmah at the beginning Seventh Cycle – the Cycle of Qiyāmah. A visual depiction of a lunar eclipse. The lunar eclipse is a symbol of the union of the offices of Imamah and Piratan during the Cycle of Qiyamah. 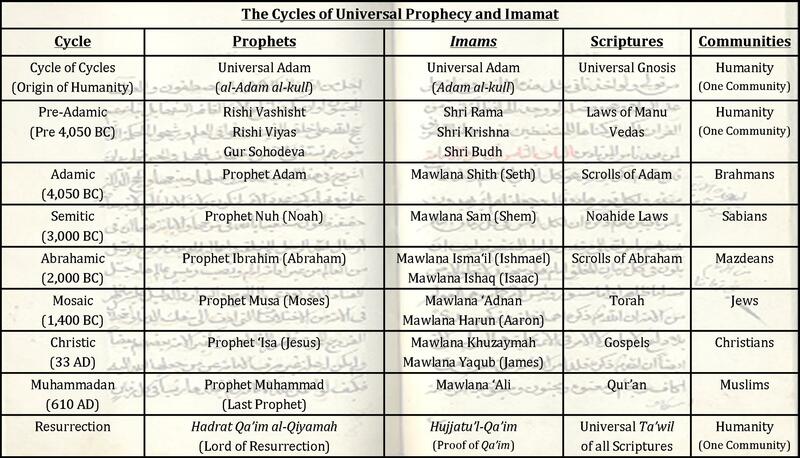 According to various Ismā‘īlī texts (i.e. Kitab al-‘Ālim wa’l-Ghulām – Ja‘far ibn Manṣūr al-Yaman; Taṣawwurāt – Naṣīr al-Dīn al-Ṭūsī), the Sun (shams) stands for the Imām and the Moon (qamar) stands for the Pīr or Supreme Hujjat (Bāb). The Imām is the spiritual father of the believers and the Pīr or Supreme Hujjat (Bāb) is their spiritual mother. Metaphysically, the Imām is the locus of manifestation of the Universal Intellect and the Pīr is the locus of manifestation of the Universal Soul. The union of the Sun and the Moon at the time of Qiyāmah means that the institutions of Imāmah and Piratan will be united in the person of the Imām during the Cycle of Qiyāmah. When the Sun is shining, the Moon and the Stars are present but not visible. This symbolizes the manifestation of the Imam and the concealment of the Ranks of Faith (hudud al-din) in the Cycle of Qiyamah. In all the cycles of prophetic history, the Imāms delivered their ta‘līm and ta‘wīl through a hierarchy of representatives and teachers – the bābs, the hujjats, the dā‘īs, and ma’dhūns. This hierarchy makes up the “World of Faith” (‘ālam al-dīn) and is known as the “Ranks of Faith” (ḥudūd al-dīn). In the World of Nature, the Imām is symbolized by the Sun, his Bābs by the Moon, and the rest of the ḥudūd by the Stars. This is related to the vision of the Prophet Joseph (Yusūf) when he saw “the Sun, the Moon, and eleven Stars” (see Sūrat Yusūf) prostrating before him. The Ismā‘īlī da‘wah – the formal and practical da‘wah that actively summons people to the recognition of the Imām – will be abolished along with the functions of the Ranks of Faith (also confirmed by Hamīd al-Dīn al-Kirmānī in his Kitāb al-Riyāḍ). A visual depiction of the heavens being rolled up into a scroll. The imagery of a scroll serves to symbolize the “scroll of the shari’ah” which is abrogated in the Cycle of Qiyamah. The various terms in the Qur’ān – “heaven”, “earth”, “mountains”, “seas”, “rivers”, etc. all contain an esoteric or ta’wīlī meaning because they refer not to the physical world (dunyā) but to the World of Faith (‘ālam al-dīn). Therefore, the real meaning of “heavens” is the exoteric (ẓāhir) and the sharī‘ah, and the inner meaning of “earth” is the esoteric (bāṭin) and the ṭarīqah. Just as the physical heavens surround and protect the physical earth, the ẓāhir protects and envelopes the bāṭin. The “rolling up” of the “heavens” means that the sharī‘ah will be abolished when the Cycle of Qiyāmah begins and the quaking of the “earth” means that the esoteric sciences will become revealed in a sudden way – in the manner of earthquakes – even though people may not be prepared for it. With respect to the abrogation of the sharī ‘ah at the time of Qiyāmah, Sayyidnā Nāsir-i Khusraw (as per Khwān al-Ikhwān) explains that the sharī‘ah of Prophet Muḥammad has two dimensions – the specified (waḍ‘ī) sharī‘ah and the intellectual (‘aqlī) sharī‘ah. The specificed sharī‘ah refers to specific formal or ritual practices as Ṣalāh (ritual prayer), Ṣawm (ritual fasting), Wudū (ablution), Hajj (pilgrimage), etc. in their exoteric form – without which mankind can still survive and function. The intellectual sharī‘ah refers to moral and ethical laws such as the laws against murder, stealing, and unethical behavior – without which humanity would plunge into chaos. When this happens – usually after more or less a thousand years – a new sharī ‘ah is established and a new prophetic cycle begins and the new Nātiq abrogates the old sharī ‘ah and compiles a new one. However, after the Prophet Muḥammad, there are no more Prophets. Therefore, the Qā’im will abrogate the specified sharī‘ah while revealing its inner meaning (ta’wīl) and simultaneously, spiritualize and transform the sharī‘ah into a higher mode of ritual practice. The intellectual sharī‘ah – as a set of ethics and moral guidelines – always remains in force and becomes more prominent in the Cycle of Qiyāmah. An image depicting how knowledge comes to light. The Cycle of Qiyamah is the Epoch of Knowledge (dawr al-‘ilm) and the Qur’anic description of “being raised from the graves” refers to the manifestation of once hidden or concealed knowledge out in the open. The Qā’im begins a new phase of human history known as the Epoch of Knowledge (dawr al ‘ilm). In the periods before the Qā’im, humanity lives in the Epoch of Practice – where both religion and worldly life are oriented around actions (‘amal) and physical resources. After the coming of the Qā’im and the beginning of the Cycle of Qiyāmah¸ humanity enters into the Epoch of Knowledgle (dawr al-‘ilm) in which there is an abundance of knowledge (‘ilm) available in a way that humankind has never seen before. “The final epoch before the advent of the Qā’im is defined as the epoch of practice (dawr al-‘amāl), and is one in which religious practices are obligatory on the part of the individual practitioner. With the establishment of the Qā’im and the commencement of the epoch of knowledge (dawr al-ilm), even the practice of obedience (ta‘ah) to the hudud al-din is no longer required… Therein arises another set of distinctions: between the epoch of practice (dawr al-‘amal) and the epoch of knowledge (dawr al-‘ilm). The dawr al-‘ilm (Epoch of Knowledge) is the time of the Qa’im, and associated with this is tayid, purity, and more significantly, “pure knowledge” (al-‘ilm al-mahd)…. Because the Qa’im is established at the end of the dawr al-‘amāl, the epoch of the Qa’im is the epoch of purity (safa), tayid and ‘ilm, without religious obligation in terms of practice (taklif). In the Epoch of Knowledge, the the Qā’im will accept and affirm the right of each community to its own religious tradition. This is also because the spiritual and esoteric meaning of scriptures will also be unveiled during the Cycle of Qiyāmah. An image of the sunlight shining through the clouds. This depicts the coming of the Qa’im and his spiritual influence in the sense that the Qa’im himself will not be recognized directly but his knowledge and inspiration – like sunlight – will permeate the entire world. These verses describe the coming of the “Lord” (rabb). However, God Himself – transcending time and space – is above the process of “coming” or “going”. This verse refers to the coming of the Qā’im and the events of Qiyāmah – indicated by the words “do they not wait” (hal yanẓurūna). The “Lord” refers to the Qā’im and the Angels who accompany him refer to the Deputies or Vicegerents (khulafā’) of the Qā’im who represent him and carry out his mission on earth. The description of “God comes to them in shades of clouds” means that the Qā’im comes to the World of Faith and the physical world while being “veiled” from people’s recognition – in the same way that the clouds may conceal the Sun from being looked upon directly. The ceiling of Glenview Jamatkhana features a pattern of seven concentric septagons. Each septagon stands for a Minor Cycle of Seven Imams. The Center of the Seven Heptagons represents the Qa’im al-Qiyamah who appears after the Cycle of 49 (7×7) Imams. Several Ismā‘īlī dā‘īs of the Fatimid period had prophesized that the coming of the Qā’im and the beginning of the Cycle of Qiyāmah would take place after the coming of forty-nine Imāms in the Cycle of Prophet Muḥammad. This is based, in part, on the above verse. Exoterically, the Seven Repeated Ones refer to the seven verses of Sūrah Fātihah. Esoterically, the Seven Repeated Ones refer to a minor cycle of seven Imāms being repeated in seven heptads and the “Great Qur’ān” refers to the Qā’im al-Qiyāmah. The advent of the Cycle of Qiyāmah and the manifestation of the Qā’im are the climax of all human history since the time of Adam. One may wonder or even doubt the plausibility of such events occurring in actual history. However, it must be known now that the Great Qiyāmah has already occurred. To read about how the Cycle of Qiyāmah begins and the manner in which the Signs of Qiyāmah come to pass in the light of actual history – Click Here to Read Part 2 of this post. I found the things which i ever had have this information about my religion. Why hazrat dawood(a.s) is not included among the list of messengers who brought sharia?he too was inspired with holy book.